Jakarta, Tuesday, May 2, 2017. Today is the signing of the cooperation between PT Sompo Insurance Indonesia (SII) and Meteorology Climatology and Geophysics Agency (BMKG). The signing of this cooperation conducted by Daniel Neo as President Director and Eric Nemitz as Operational Director of PT Sompo Insurance Indonesia with DR. Andi Eka Sakya, M. Eng as Director General of Meteorology Climatology and Geophysics Agency (BMKG). This cooperation aims to build the welfare of Indonesian farmers by launching the product "Weather Index Insurance". This product is one of the first micro insurance products launched in Indonesia. As we know, uncertain weather can affect many sectors, including the agricultural sector. These conditions can disrupt crop yields and result in instability in Indonesian farmers' incomes. Within every three months according to the harvest period, BMKG will provide data to Sompo Insurance Indonesia in the form of rainfall data. If the index of rainfall is below and or equal to the established threshold, then Sompo Insurance Indonesia will give compensations to the policyholders (farmers). The initial location will start in the October to December 2017 harvest period and will be conducted in Bojonegoro and Central Lombok districts and will continue to expand to other parts of Indonesia. 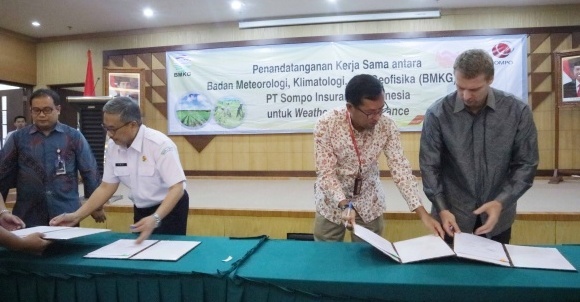 This signing is one of Sompo Insurance Indonesia's initial steps with BMKG as a Non-Ministerial Institution that provides and disseminates weather, climate, and earthquake data and information to the public. So, through climate and weather information is expected to help the agricultural sector of Indonesia to be more ready and alert to climate and weather behavior so that the welfare of farmers and the Indonesian economy will be maintained and far from losses.